Lynette McHendry from Magheramorne, Craigyhill native Norman Houston, and Islandmagee’s Margaret Henderson were among the 90 people from Northern Ireland who received accolades from Her Majesty. Lynette was given an MBE after working tirelessly to raise awareness of inflammatory breast cancer (IBC) - all while battling the disease herself. A rarer and more aggressive form of the disease, the symptoms of IBC include pain, redness and swelling in the breast; it may not always cause a lump to appear. Inflammatory breast cancer tends to occur more often in younger women. Lynette was first diagnosed in August 2015 and was due to begin treatment for invasive carcinoma in her right breast when she discovered she had IBC in her left breast. The 39-year-old also underwent a double mastectomy after learning she had inherited the “faulty” BRCA 1 gene, putting her at a higher risk of breast and ovarian cancer. The Magheramorne woman had over two years of gruelling radiotherapy and chemotherapy treatment, during which time the cancer spread to her brain. Thankfully, a series of scans conducted after her treatment concluded in March 2018 came back clear. Since her diagnosis, Lynette has raised over £28,000 for the Inflammatory Breast Cancer Network, which is contributing towards the UK’s only study into the condition at Birmingham University. 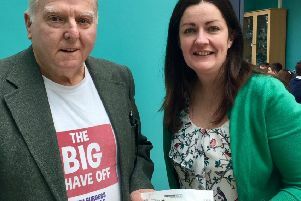 She also helped generate £38,000 by organising a black tie dinner, with the funds going towards research into the BRCA 1 gene at Queen’s University Belfast. Speaking about her MBE, Lynette said: “It’s a real honour to get it; I was delighted. “Ever since I was diagnosed [with IBC] I thought, people need to know about this, and that’s why I went public with it all. Meanwhile, Margaret Henderson, formerly of Islandmagee Community Development Association, was awarded a British Empire Medal (BEM) for services to the community in Northern Ireland. Originally from Greenisland, she moved to Islandmagee in the 60s, where she immersed herself in a number of local organisations. “My husband was in the Merchant Navy and I was at home with the children,” she said. “I became involved with the Girl Guides and getting the first playschool at the Methodist Church. The local woman also dedicated her time to charity endeavours, including collecting for the Royal British Legion’s annual Poppy Appeal and fundraising for Cancer Research. “I was also a home visitor with Age Concern and that really brought to light how isolated some older people in the community are,” Mrs Henderson said. The 81-year-old said she was “knocked off her feet” when she received news of the honour. “I honestly was blown away by it. It makes you very humble." Meanwhile, an MBE has been awarded to a Larne man whose job has taken him from his native Craigyhill to the White House. Norman Houston, director of the Northern Ireland Executive Bureau in Washington DC, received the accolade for his efforts to promote the province overseas. The Bureau represents the Northern Ireland Executive in North America; the 60-year-old has spent 10 years in the senior diplomatic role. “I was delighted to receive the letter from the Cabinet Office; I had to read it twice just to make sure I’d picked it up right!” he told the Larne Times. In a career full of many stand out moments, one of his most memorable occurred in the early stages of the post in 2007. “I was in the White House Oval Office with President George W Bush, along with Ian Paisley and Martin McGuinness, who had just been elected First and Deputy First Minister,” he said.